There are many energy saving solutions for different problems in the market, so you have to make sure you pick the right solution for YOUR problem. Otherwise, you might end up spending thousands of dollars without seeing any change in your energy bills. We recommend you determine first which are the biggest contributors to your energy bills and address them first, so you can have the greatest reduction in your energy spending. Energy Care Technologies can guide you through this process, provide you the tools and products to maximize your savings. Define: Determining the energy spending problem you want to resolve; For example, is it an entire building, or just a specific area? Measure: Assessing the energy performance in the defined problem area by continuously monitoring and measuring the energy usage in specific circuits. Analyze: Reviewing the monitoring output in detail, trying to find out which the biggest contributors to your energy bills are, the energy usage pattern, etc. Improve: Choosing the ideal energy saving solution to address the top contributors to your electricity bills. You might save tons of money just by changing some habits, which costs you nothing! Other solutions might require focusing on lighting, air conditioning, refrigeration, more efficient appliances, motors, insulation, etc. Only after the analysis, you will be able to determine your most cost-effective options. Control: Staying on top of your energy spending after you have implemented the improvements so they don't run out of control again! Whether it is a house where four people live or an office building where 50 people work, generally there is only one person that get to see the electricity bill at the end of each month. Still, that person may not have a notion of the cost of the electricity they are paying for, much less the cost of keeping an electronic equipment, and appliance, or lights turned on. The best energy saving opportunity is to make everyone aware of the cost of the electricity that they use. People are amazed to learn how much it costs to run our appliances, computers, printers, copy machines, or air conditioners. The Kill A Wattâ products show you how much every individual appliance costs you every day, month or year in kWh and dollars. They also tell you about the quality of the electricity you use: Volt, frequency, and more. Finally, they also show the equivalent CO2 emissions of the energy you use. Energy Care Technologies assists companies and other institutions with the roll out of energy saving programs to engage every employee, because saving energy is a mission for everyone who uses it! By simply plugging your electronic equipment to the Kill A Watt®PS10 Power Strip, you will be able to know how much power your PC network is consuming, while protecting the expensive equipment against power surges. What a powerful tool to lower spending in energy when every employee can see, right at his/her desk, how the daily, monthly, or yearly consumption forecast ($) goes up or down every time they turn a piece of equipment ON or OFF. Kill A Watt®PS10 Power Strip also exposes "phantom loads" in action, using up power, while your electronic equipment sleeps! - You can decide which piece of equipment has to stay plugged in. Now that everyone is aware of the actual cost of the electricity they use, they are likely to act differently when they see energy being wasted at work and at home. The best investment to save energy is to cut the waste and Kill A Watt®PS10 Power Strip empowers you to do that! 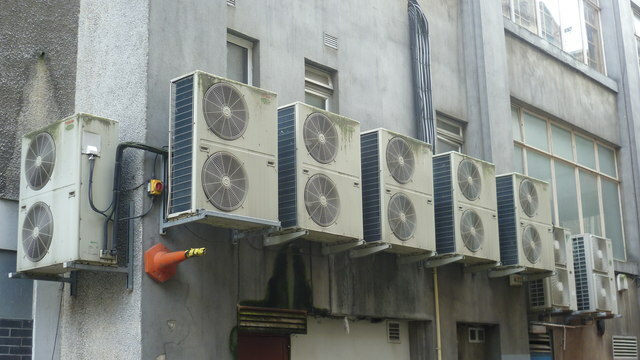 Air Conditioning Systems are one of the largest energy consumers in both, residential and commercial sectors and account for a for significant part of your electricity bills. The opportunity to lower A/C' running costs cannot be overlooked, as you may achieve energy savings of up to 35%. Air conditioning systems are normally switched on/off automatically by a timer or a room thermostat. Tipically, both the compressor and fan within the A/C run continuously until the room temperature reaches the desired level set through the thermostat. The compressor consumes most of the energy, while the fan uses little energy in comparisson. ACES is a device that optimizes the use of energy associated with air conditioning systems, cutting energy waste by reducing the compressor cycling, while maintaining comfort levels. Reducing compressor cycling also helps to lower A/C maintenance costs. ACES is ideal fit for split air conditioning systems. Lowering energy spending and reducing maintenance costs, while improving your comfort levels and reducing your carbon footprint, means that ACES delivers Smart Energy Savings! Refrigeration systems account for around 20% of the world’s energy consumption. Fortunately, there is room to improve on efficiency, reliability, and control of the temperature of food products. Commercial refrigeration systems measure air temperature and control that temperature at a pre-determined level that is set on the thermostat. By controling the temperature of air inside the refrigerator, it is assumed that the stored food will take on the same temperature. However, thermal characteristics of food are seldom the same as the air, resulting in unnecessary cycling of the compressores due to air temperature fluctuations. Compressors demand most of the energy used in refrigeration systems, particularly during each start-up. CUES can help reduce the frequency of compressor starts by up to 80%, resulting in energy savings of up to 33% without compromising food safety and quality. CUES are devices that contain high-tech food simulant with similar thermal characteristics as typical food. They can be easily installed over the existing thermostats inside the refrigeration system, ensuring that the refrigeration control system reacts upon changes in food temperature, not air temperature. You can now lower energy spending and reduce your carbon footprint associated with your refrigeration systems with CUES... another Smart Energy Saving Solution offered by Energy Care Technologies.